Darrell General is used to operating on a tight schedule. 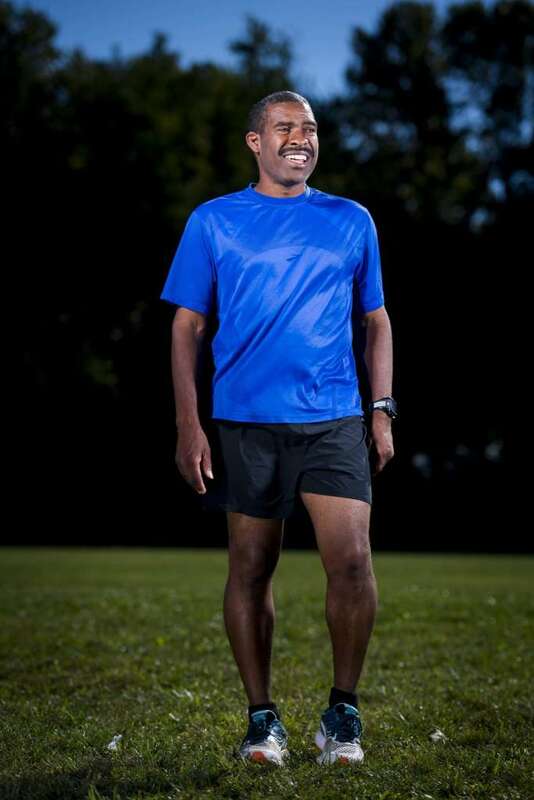 Thirty years ago, when he qualified for his first of five U.S. Olympic marathon trials at the Marine Corps Marathon, General was training hard and working harder at multiple jobs. Today, General, 51, is right on time for a 4 p.m. interview for the Pace the Nation podcast. As long as we get this done in 45 minutes, he’ll still have enough time to drive over to George Marshall High School in Falls Church, Va. to set up a cross country course for tonight’s pre-season time trial. General has been head coach there since 2002. Here in Arlington’s Studio 1A, as it’s called, I’m subbing for house jokemaker Docs, joined by his two podcast co-hosts: Pacers Running Owner Chris Farley and Pacers D.C. Manager Joanna Russo. General’s story has been on my mind lately as I encounter how difficult it can be to balance fatherhood (my son recently turned 1) with my running goals. After talking to General, I know I’ll have no excuses. 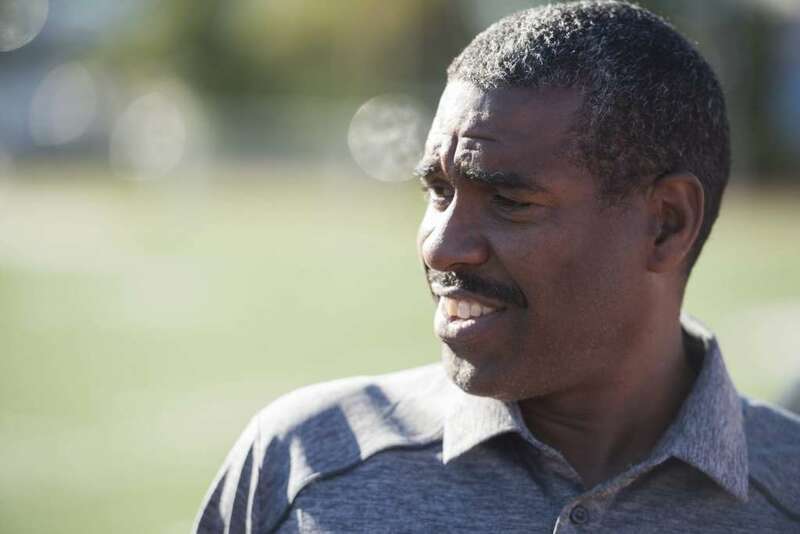 You see, when General was running his best, he often went from a graveyard shift at a grocery store to a morning shift at a running store to an afternoon coaching job. Always, he found a way to train. Less often, he slept. General just got it done — day after day after day. And his results were proof of that. My personal pick for Greatest Working Runner of All Time, the Southeast D.C. native is among less than a handful of athletes who qualified for five marathon trials. General won MCM in 1995 and 1997. He won the Army Ten Miler three times. He was top American and 14th overall in the 1990 Boston Marathon, clocking 2:15:30, and has a lifetime marathon personal best of 2:14:42. 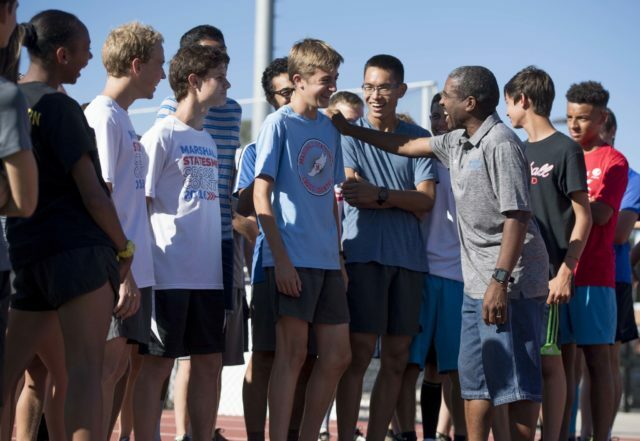 He accomplished this despite the fact that, throughout his career, running remained subservient to physically demanding jobs, to supporting his family and, especially, to high school coaching–General’s preferred way of giving back to a running community he says gave so much to him. As it happens, this year also marks General’s 30th year of coaching. He first coached at his alma mater, Potomac High School, in Oxon Hill. Later, when he started at George Marshall, he lacked enough athletes to field a full team. Last year, the George Marshall girls won the Virginia 5A Cross Country Championship–their first ever–led by then-junior Heather Holt‘s individual victory. There were times when General was encouraged to set coaching aside to focus on his own running. He always refused. And while General no longer races much, this year he had big plans to get himself back in top shape. He wanted to celebrate the anniversary of his breakout 1987 MCM race and the 20th anniversary of his second MCM victory in style, with a big performance. But as we meet today, even if General doesn’t talk about it, those plans are changing. We will find out later that his mother isn’t well. Instead of training, lately he’s been tending to her, helping out his father as much as he can. 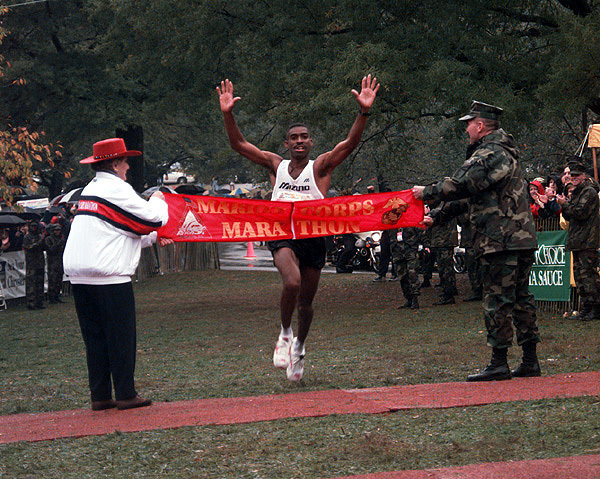 In our interview, we looked back, tracing General’s rise from a 17-year-old marathon debutant to an elite runner who cranked out legendary performances for more than 20 years. Farley: You didn’t follow the traditional path of an elite runner where you went on to run in college. How did you get started? General: My love for running started at 8 when I was running in Southeast. Growing up, I used to watch ABC’S “Wide World of Sports.” It was fascinating to me to see guys like Frank Shorter and Bill Rodgers running at a fast pace for such a long period of time. That stuck with me as I got older as a goal of mine: run marathons. Farley: Was anyone in your family a distance runner? General: My dad used to just go out and run. That’s how I got started with running. I used to go run with him in the park. I used to go around and go around, keep passing him, and waiting for him to say something. He kind of set me up because he would never say anything. He just wanted me to keep running until I got tired. I actually enjoyed that, so I continued with that type of training. I just used to go run 15 to 20 minutes three or four times a week. Farley: Were you in high school when you first ran the marathon? General: I had just graduated. One of my track coaches was running MCM. He wanted me to run with him, and I was hesitant about it. He said he would pay my entry, so I said okay. That’s how that started. Mercer: What was your longest run at this point? General: I might have did an 18. I was learning at that point. I knew I needed to do at least 60 to 70 miles a week–that was my main goal–and to try to get maybe two long runs in. I just wanted to make sure I was strong enough to finish the race. My first aim was to do that. I was very inexperienced; I was way at the back. I went by the number, which was 12,000, and it took a few minutes to get across the starting line. General ran “2 hours and 58 minutes and some odd seconds.” He was 17. Mercer: How did the 20s [miles] feel during that first marathon? General: I understood what the wall meant. My first one or two, right around that 20, 21-mile mark, I would hit the wall. What I did was, I was determined to train hard enough to get past that spot where you break down. I made sure my mileage was strong enough. I wasn’t really a high mileage person, but I hung around 80 miles a week to 100, even with 23 milers and 24 milers. As long as I did three 20 milers, I felt like that would get me over the hump of that wall that would come around 20, 21. Farley: When you took on the Marine Corps Marathon the first time, did you have an idea that you wanted to qualify for the trials at that point? General: Actually, after my first one. Even though I ran 2:58, my goal was to try to qualify for the Olympic Trials in ’88. In the ’87 MCM, he’d have to run under 2:22–and he did, finishing second in 2:19. Farley: What was it like to be the youngest trials qualifier at 21? General: I mean, overwhelming experience. You have goals that you set for yourself, but when you achieve them it’s just like, wow. When I did, I just sort of cried, because I really didn’t think that it was going to happen. Farley: Tell us about what MCM means to you? General: Marine Corps is still my favorite race to date. I love that race. That’s where my career started off at. In ’95, I actually was going to Chicago to go and run 2:12 or 2:11. But at that time I had an agent, and we talked about it, and I decided I wanted to run MCM. It wasn’t just for me; it was for my family; it was for the D.C. area…. I wanted to come and win it for the Washington area and get that victory there. That was important to me to win it at home for everybody. Chris: And Marine Corps offers no prize money. General: I really gave up money, because I definitely was in 2:12 shape. But to me, the win will last a lifetime. Me running Chicago and getting $8,000 or $10,000–nobody’s going to remember that. I wanted the MCM win on my resume. That’s something that I can look back on and talk to a lot of runners about. Farley: A couple of years later, you come back and win it again. General: The ’97 marathon, I actually was in better shape than ’95. That year, I trained through the summer, speed work and everything, because I wanted to break the course record of 2:14:01, and I actually was in shape for it. I had my game face on. I was ready to run. But it poured down rain 10 minutes before the start of the race; it was like a flood race. Once I came through Georgetown, I came through right on pace–51:30 at 10 miles. But my shoes were soaking wet, so I backed off the course record challenge and just wanted to go for the win. I didn’t want to blow my win. Farley: You were always working, too. General: When I was at my best, especially my 20s, at one point I was working at Fair Oaks Mall at the Sears. I was working about 50, 60 hours a week and training for Marine Corps in ’84, ’85, ’86 while working in a loading dock. I was doing a lot of lifting. I was exhausted. I would come home and do hour-and-a-half runs. I chose that path, and once I became an elite runner, I never gave that up. It’s one of those things: I didn’t know how to give that up. When you were in the world of working hard, working a job, trying to make a living, coaching high school track, I loved running so much that I focused on running and working and coaching and helping people out. I didn’t know how to give that up as an elite runner, and I think that prevented me from getting faster. I got faster at a shorter distance, but the marathon was at a standstill because I had too much on my plate. Mercer: Did you ever get sponsorship opportunities? General: I ran for Reebok ’87, ’89. Then ’90 to ’98 I was sponsored by Mizuno. It wasn’t an endorsement deal; it was more of a bonus deal. I got a lot of things taken care of, but I didn’t get a yearly stipend. I was probably two minutes shy of getting the yearly money but, like I said, if you’re an elite runner and you’re trying to go to that top level, you cannot work two, three jobs and those things. Farley: How do you even get your run in? General: I just made time. I was so focused on trying to do what I need to do on a financial level. When you start from scratch and you become ranked in the top 10 in the country, I felt like I had something to give back to the kids who think that they can’t accomplish the goals that they want to achieve. That was the biggest thing. That’s what kept me going. I never thought about, I’m going to be tired or is there enough time. I just made it happen. Farley: What time does your day start when you’ve got those jobs? General: At Whole Foods, I was working 1 a.m. to 8 a.m. Then I was leaving there and going to the D.C. running group — D.C. Fit. I was helping out there from 8 to 9:30. Then I was working at Metro Run & Walk from 10 to 3. Farley: You still haven’t told us how you get your run in. General: I would coach from 3 p.m. to 5 p.m., so my run at that point in time was with the D.C. Fit. When I got off of Whole Foods, I would drive to the W&O. And once you got into August, they were already started. I stretched real quick and then I jumped in. When they saw me, I was going down, and they were coming back. All those 75 people saw me, so their goal was to keep me from catching them. It was helping them, and it was helping me. We had fun. Russo: When did you sleep? General: I didn’t get many hours sleep. I would lay down for three or four hours. When I tried to qualify for 2008 trials [what would have been General’s sixth] I didn’t realize my body was exhausted. I just worked and trained, and I was in great shape, but my body didn’t have the energy to qualify. I was working three jobs because I was getting ready to get married, so I was trying to work to save money. Both me and my wife were working so that we could just pay for it out of our pocket. She was working an extra job as well, so we both were exhausting ourselves. But it paid off, we didn’t owe any debt. Mercer: In 1989, when I was 8, I went with my family to a big road race up at Giants Stadium — the New Jersey Waterfront Marathon. My dad was racing the 10K; I did the 100-meter dash on the field. This was a huge marathon at the time, big prize money. And I recently found a New York Times article about that day, and it happens to mention a 23-year old dock worker, Darrell General, running a huge personal best of 2:14:42. It was like a five-minute PR. Can you kind of take us through your breakthrough that day? General: Well, part of the course was the Olympic Trials course. I studied the whole four or five months of how I was going to run that race, the hilly part of the course down to how I wanted each mile split, where I wanted to be and targeted it down to the last 10K. I stayed on track throughout the whole race, and everything just started clicking; everything in the second half started to roll. It wasn’t a fast flat course. I ran 1:06:52 and 1:07:50, but because of the way I strategized the race, I closed with a 4:56 last mile. Mercer: And it finished on the field! Farley: Your best trials was ’96. You were 12th place in 2:16:30. Were you thinking Olympic team? General: To be honest with you, I actually was. The downfall for me was I didn’t get out of D.C. In ’96, there was a blizzard, and I was stuck for three to four weeks in Maryland and I couldn’t train, so I lost that amount of time of training. I was fit, I was strong, I was fast, I just felt that I clearly was going to be one of the top three. Mercer: At what point did you start wondering how many trials you could qualify for? General: Approaching five, I actually thought I was going to get to seven, to be honest with you. But I kept on taking on more responsibilities. When it got to the sixth round, I was getting ready to get married. The next one I was training, but I had tendonitis, so I backed off the training for a little while. I started back but things kept getting in the way, because I wouldn’t give up coaching, I wouldn’t give up working. At that point in time, even at 42, I still was fast enough and strong enough that I could have run 2:18, 2:19. Mercer: Kieran O’Connor, who runs for Pacers Running//GRC-New Balance, was 24th in the last trials. Now he’s going for his second qualifier at MCM. He wanted to know if you ever had doubts about qualifying during your streak. General: Each Olympic Trial that I approached, I believed that I could come in the top three. Even ’88. I was young, but in the back of my mind, anything can happen, so you can’t rule yourself out. Mercer: I think that self-belief is really inspiring, because even reading about your attempt to qualify for the sixth, it was clear that things weren’t quite clicking in training. Some of your tune-up races, you weren’t able to run Trials pace for a short distance, but you still believed on that day you could do it. A lot of runners get really self-defeated. If they can’t do it in a race leading up to it, they just don’t believe it’s possible, but you believed it was possible. General: I always believe. The training was going well. The racing wasn’t, but a lot of my races that I’d run in previous years back, even if I ran a 31-something 10K three weeks before a marathon, I would still run 2:15. It’s all about focusing on what the goal is: I would not worrying about running 31, but convince myself I run could 32s for 10K three or four times in the race. That’s what got me through. For 45 minutes, General graciously and happily answered every question we threw at him. But when it got to the end, he had one request: He wanted the chance to thank his family. Looking back on it, remembering the emotion in his eyes, this was the one time that he revealed some of what he was coping with personally. General: I have three kids. My kids are older now, so I was trying to be a daddy as well, but do the right thing and set an example for my kids. My parents and a couple of my aunts and uncles were very, very supportive. My mom and dad would go all over the country to make sure that I had everything that I needed. From a financial standpoint, if none of the shoe companies wanted to bring me in, my mom and dad would drive me and put me up in a hotel. Now I’m married, and my wife is the same way. My wife handles everything else. It allows me to go out and train and coach and do the things that I need to do to continue my marathon streak. Farley: It does take a group of people, and people who are supportive and understand, because it’s not easy. You’ve got to be out there, and sometimes people see it as a selfish pursuit. It’s great to see how much you’ve given back through your running. I really applaud you for that. General: Thank you guys, and thanks D.C and the Washington area for all the support you’ve given me throughout my career!